How much does it weigh? Will it burn? What is its boiling point? Under what pressure will a tank be subject to on a hot summer day? Anhydrous ammonia is a colorless non-flammable liquefied gas. Its vapor is lighter than air [(vapor density of 0.6) air = 1] and has the same pungent odor as household ammonia. Although ammonia vapor is lighter than air, the vapors from a leak may hug the ground appearing as a white cloud. Chemically ammonia is 82% nitrogen (N) and 18% hydrogen (H) and has the chemical formula NH3. The definition of anhydrous is without water. Whereas household ammonia is 95% water, anhydrous ammonia has no water. Ammonia is so hydroscopic (water loving) that one cubic foot of water will dissolve 1300 cubic feet of ammonia vapor making water the primary weapon for first responders. When ammonia reacts with water the base ammonium hydroxide (NH4OH) will form. Ammonia weights 5.15 pounds per gallon in contrast to water which weights 8.33 pounds per gallon. Since ammonia is very soluble in water there will be no layering effect when liquid ammonia is spilled into a surface water body. Booms, pads, sweeps and pillows that are usually used to contain and recover petroleum are ineffective on spills of ammonia into surface water. Ammonia is a nonflammable gas but will ignite at a temperature of 1204°F within vapor concentration limits between 15% and 28%. (Paper ignites at 450°F, coal at 750°F). Outside conditions that would support these vapor concentrations are rare. Liquid ammonia boils at any temperature greater than -28°F and will expand to 850 times its liquid volume. One gallon of liquid will expand to 850 gallons or 113 cubic feet of gas. Whenever a liquid is confined in a closed vessel at a temperature greater than its boiling point there will be a measurable pressure against the confining walls. Since ammonia boils at -28°F a tank pressure will always be measurable. This relationship between pressure and temperature can best be written as: PV~T. where pressure (P) and volume (V) is somewhat equal to temperature. Simply put, by raising or lowering the left part of the equation (P or V), the right part (T) must do the same and visa versa. Examples: A drop in pressure (P) caused by a tank valve leak will cause the liquid temperature (T) to drop. The tank volume (V) stays the same. If the liquid temperature continues to drop to -28°F or its boiling point, ammonia has auto refrigerated which is to say it stops boiling. At this point the ammonia and tank are much less dangerous to handle. A tank that rapidly loses pressure will be covered with frost. The frost is the result of the tank shell cooling below the freezing point of water and moisture from the air condenses on the tank and freezes. Another example of pressure change is when the tank is infringed upon by fire. The flames heat up the tank walls which increases the temperature of the confined liquid ammonia. Added heat will vaporize more ammonia increasing tank pressure. In this situation it is very important to keep the tank cool by spraying copious amounts of water over it. Wonder why tanks are painted white? 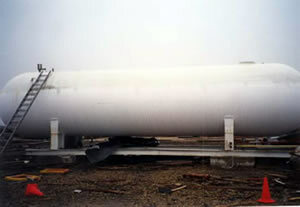 Ammonia tanks are required to be painted white or other light reflecting color to reflect the sun's radiant heat. This keeps the tank much cooler and at a lower pressure. Tanks are also equipped with pressure relief valves. If an ammonia tank overheats these valves will open and release vapor which reduces tank pressure protecting the tank from rupturing. When the tank pressure drops to a safe level (250 psi) the valves will reseat or close. Below is a table showing the relationship between temperature and pressure. Even on the coldest of winter days a pressure can be measured. A pressure reading of about 200 psi is exerted on the interior tank walls on a hot summer day.